fire belt and afforestation initiatives. Conflict arose on issues of land ownership and different perceptions of whose responsibility it was to mitigate disasters. 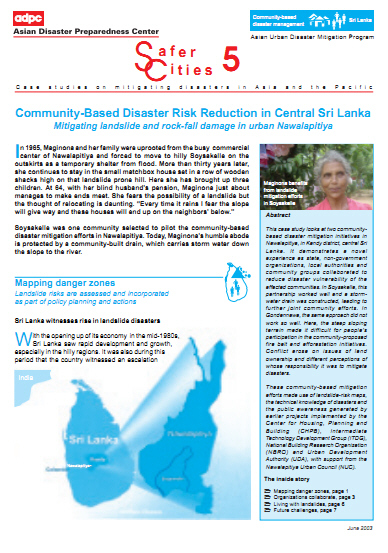 These community-based mitigation efforts made use of landslide-risk maps, the technical knowledge of disasters andthe public awareness generated by earlier projects implemented by the Center for ousing, Planning and Building (CHPB), Intermediate Technology Development Group (ITDG), National Building Research Organization (NBRO) and Urban Development Authority (UDA), with support from the Nawalapitiya Urban Council (NUC).